Features: High quality black anodized finish Lightweight aluminum construction Type Swivel Reusable Hose End Size AN 6 Angle 90 Degree Material Aluminum Anodized Black Application Fuel / Oil / Gas / Water For more Motors and Racing Parts , Visit >http://anxfittings.com/ Read more.. Type Short Throw Shifter Applications Nissan Fairlady 300ZX 90-96 Material High Quality Steel Specification Roller Bearings For Long Lasting Hard Driving. Designed for Motorsport use. This Will Reduce Throw up to 40% and Give you a Faster Shift Throw ... Read more.. Type: Radiator hose kit Color Option: Blue / Red / Black Material: Silicone Application: Honda Accord CF4 SIR / T Year: - Engine: CL7 Euro-R K20A Description: Accept higher pressure than the original The temperature change will not affect the shape and the flow ... Read more.. 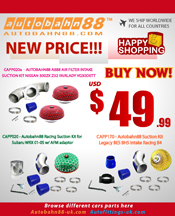 Type Flare Caps Adaptor Size - AN 6 Color -Anodized Black Material - Anodize 6061 Aluminum Alloy Application - Universal - Fuel / Oil / Gas / Water For more Motors and Racing Parts , Visit > http://autobahn88-uk.com/shop/en/ Read more.. Type Short Throw Shifter Applications Mazda RX7 FD3S Material High Quality Steel Specification Roller Bearings For Long Lasting Hard Driving. Designed for Motorsport use. This Will Reduce Throw up to 40% and Give you a Faster Shift Throw Through ... Read more.. 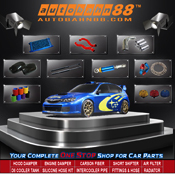 Allows more workspace under the hood by eliminates any obstructions • makes opening and closing the bonnet quick and hassle-free • No drilling or modifications to the vehicle is needed • Simple and ... Read more.. Type: Radiator Hose Kit Color Option: Blue / Red / Black Material: Silicone Application: Honda Civic FD2 Type R Description: Accept higher pressure than the original The temperature change will not affect the shape and the flow rate. Not Easy to ... Read more.. Type Y Block AN Adaptor Union Material Aluminum Anodized Angle - Size AN6 Inlet x 2 AN8 Outlet x 1 Application This is a Tee-Join AN adaptor for hose connection. 2 x AN6 Hose join to 1 x AN8 Hose Other Black For more ... Read more.. Type Short Throw Shifter Applications Audi A3 ’00 -’01 1.6 / 1.8 / 1.8TD Material High Quality Steel Specification Roller Bearings For Long Lasting Hard Driving. Designed for Motorsport use. This Will Reduce Throw up to 40% and Give ... Read more..